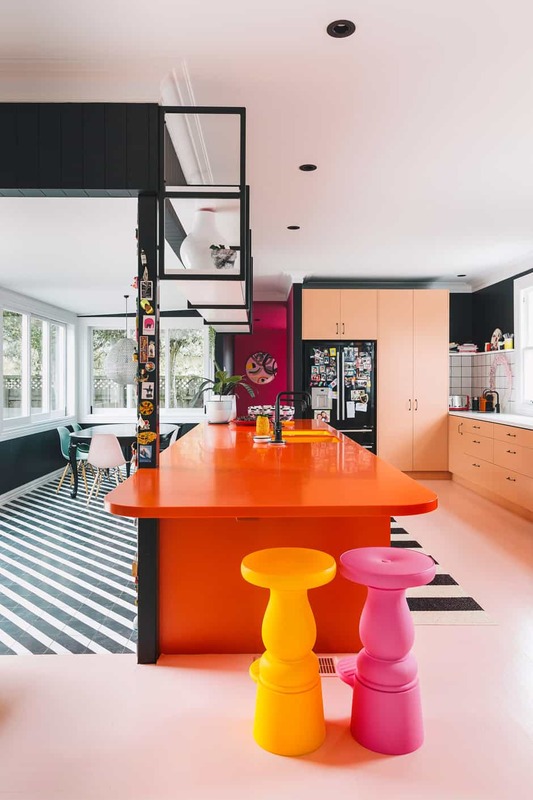 Behind the black and white facade of this Marlborough home, there’s a riot of colour that makes you feel like dancin’. The term ‘classic villa’ is real-estate jargon that many New Zealanders are familiar with. 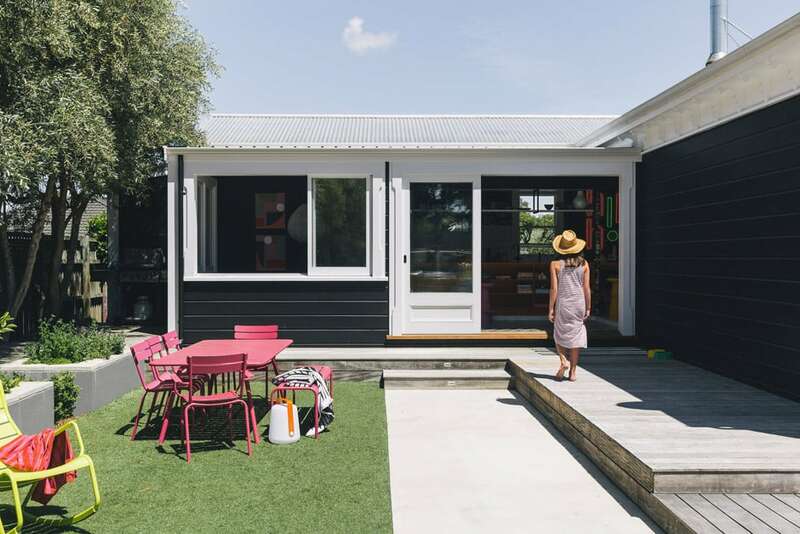 Stately weatherboard structures with pitched roofs, wide hallways and spacious bedrooms – it’s a set of appealing characteristics that make up for what’s often lacking in the kitchen and laundry departments. DINING A pendant light by Paris au Mois d’Août from Madder & Rogue, Eames chairs, and a dining table found on Trade Me and painted in Dulux Blackwood Bay (the same shade as the walls) are complemented by Alex’s own artworks, The Twins. She and Daisy are pictured above. 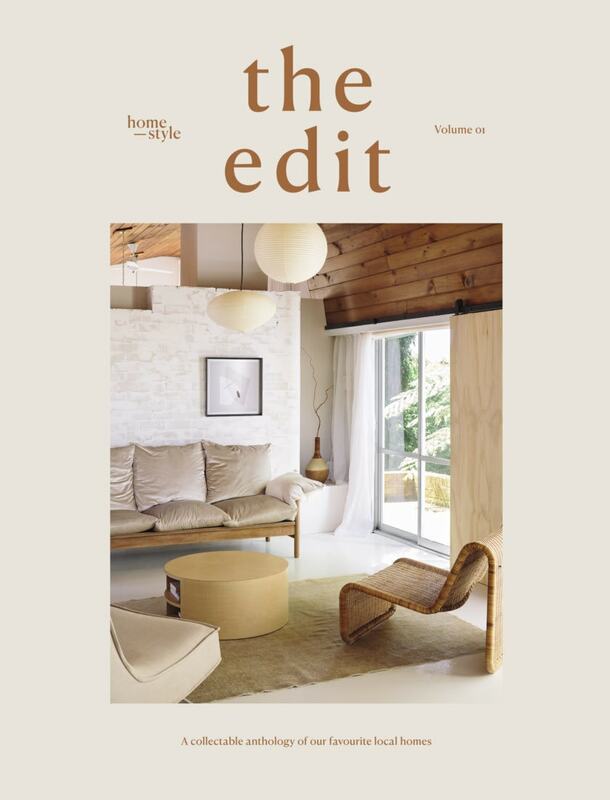 When Alex and Jeff Fulton first set eyes on their Marlborough villa, they were enamoured with its heritage architectural elements – enough that they could look past the “50 shades of beige” interior towards their vision of a colourful home for their family. 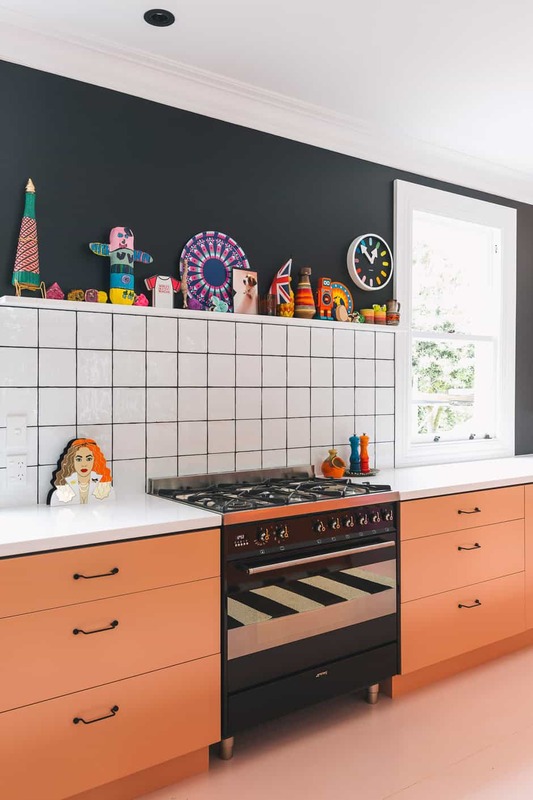 On moving in four-and-a-half years ago, the first thing they did was repaint throughout; they knew a larger- scale renovation was on the cards, but it was to be undertaken in stages as time and money allowed. Working on a reno in a regional area also requires a little more planning ahead to book in builders and subcontractors. KITCHEN The cabinetry is enlivened with Dulux Hot Embers and Dulux Broadway. 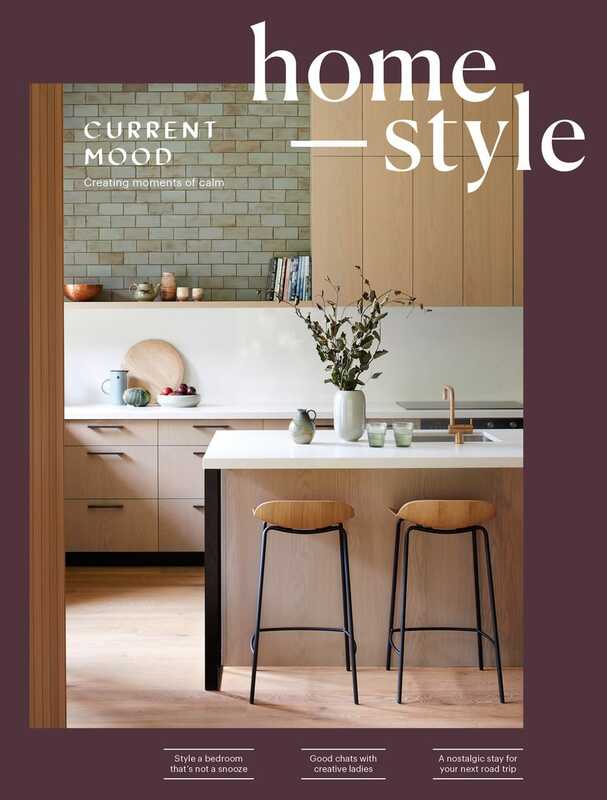 “Creating a black negative detail added a luxe component that brought a modern element to a stock MDF design,” adds Alex. The bathrooms were shifted to create an ensuite linking daughters Isla and Violet’s bedrooms, and a main bathroom that Alex and Jeff share with guests. 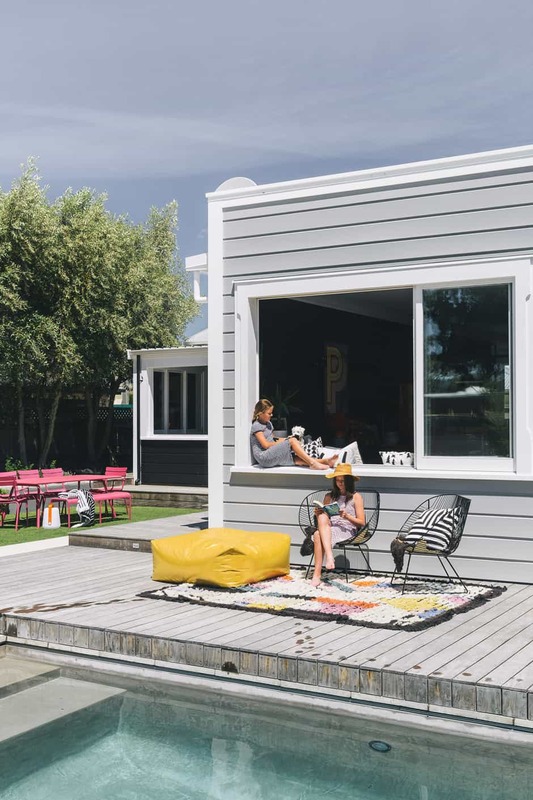 Next, landscaping transformed the backyard into an outdoor living area with a pool – a space that would eventually be accessed from the open-plan kitchen and living zone. LIVING Orange steel-frame chairs by George Nelson for Herman Miller are a great match for the Pyroclassic fire and sit alongside an embroidered artwork by Rachel Castle. The floor is painted in Dulux Pale Blush. From the playful collections of curios to the meticulous finishings of the architraves, the renovation has successfully integrated the boldly modern while honouring the villa’s heritage. 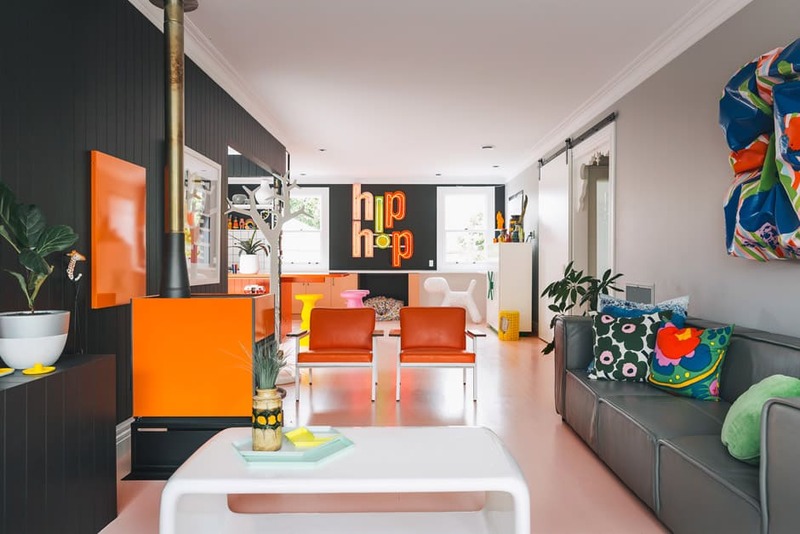 Here, the Hip Hop neon light is from World, and the sculptural 3D painting on the right is by Miranda Parkes. TOP As a foil to all the colour, Alex opted to stick with black and white for the window seat area. The screen-print is by Tony de Latour. MIDDLE The floor lamp behind Freds is from Simon James Design, and the jungle print is actually a piece of wallpaper, retained and framed as a memento of the room’s previous décor. The wall is in Dulux Franz Josef Half. 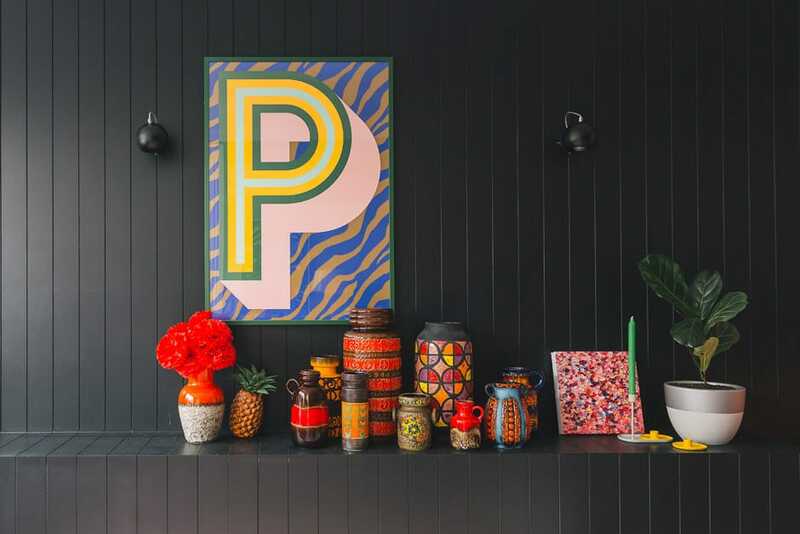 ABOVE Either side of the ‘P’ print from Playtype are Ball wall lights from Accent Lighting. The aim of the renovation was to open things up, but Alex has always had a love-hate relationship with open-plan spaces. “As an interior designer, I want rooms – walls to work with, surfaces to hold collections and intimate spaces where we can gather as a family,” she says. Changes in floor level and ceiling height, and the considered placement of built-in furniture, subtly divides the area into a series of moments dedicated to meeting the family’s various needs throughout the day. Instead of pendant lights above the long kitchen bench, Alex designed a ’70s-style shelving unit to anchor the island in the room and frame the view of an old oak tree beyond the sliding doors. Black tongue-and-groove panelling wraps around a tiled step-down dining area, then continues along the length of the living space, incorporating a boxed display shelf – on which is stashed an ever-changing collection of art objects – and bench seating beneath three sliding windows overlooking the pool. EXTERIOR The outdoor area is made comfortable with Fermob furniture, an outdoor wood burner from Mitre 10 and sun loungers from Design Warehouse. POOL Violet (left) and Isla catch some rays on the deck, where a rug and Gold Nugget ottoman by Kip & Co are used to create an outdoor relaxation zone that can easily be brought inside if the weather turns. 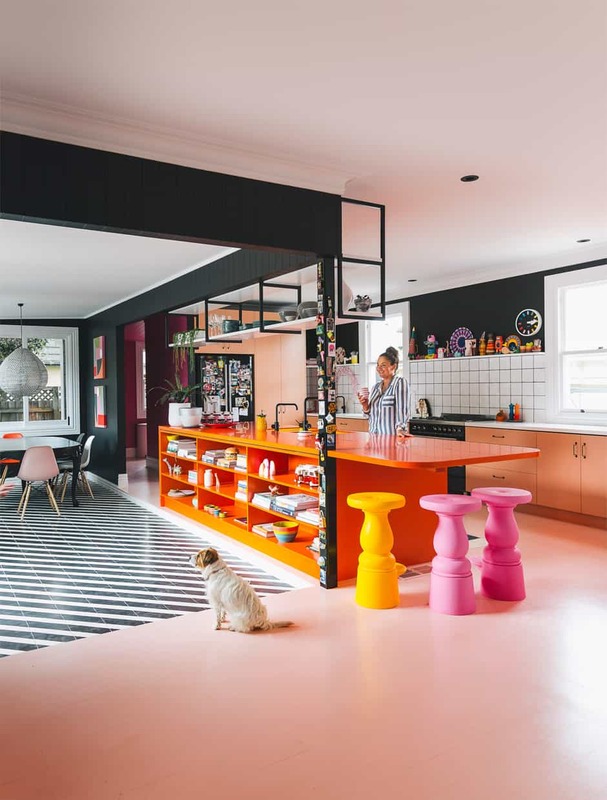 No happy accident, this home is the work of a considered designer who has honed an interior aesthetic where the whole is greater than the sum of its parts. “Because it’s my own house, I had the luxury of time to analyse my options so that every detail was thought out,” says Alex. “We didn’t rush it because we wanted to get it right.” Click here to see the Fultons’ previously featured bedroom renos, and click here to see her bathroom reno.